Yes, there you were, maybe 30 years ago, standing at the end of a road before a small brick building. If you have Master Adventurer status and you've found the repository, then I hope you will find my map nostalgic. If you haven't, then please don't look. You may be frustrated at the moment by the shadowy figure waving back at you from across the pit or you may be at Witt's End, but stick with it without looking at the map. 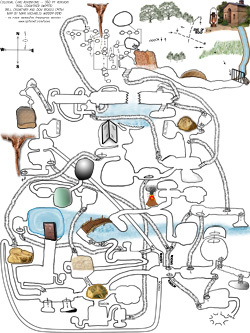 My map is based on my perception of the Colossal Cave Adventure 350 point version game, originally written by Will Crowther (1975) and revised by Will Crowther and Don Woods (1976). 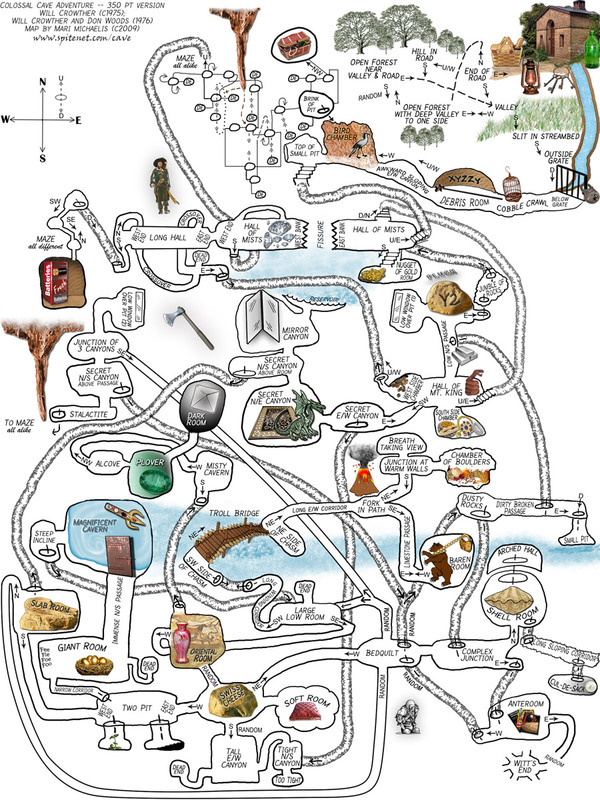 I've included a web-viewable .jpg, mobile phone sized .jpg, and a PDF print version. Since the PDF version is for printing on 8 1/2 x 11 inch paper, the file size is large (1.3 MB). Please download the file if you want to print out the map. I've set the link for it to go straight to the download pop-up to save on bandwidth. The .jpg version is large enough to clearly view in your browser, but the print quality would be poor. 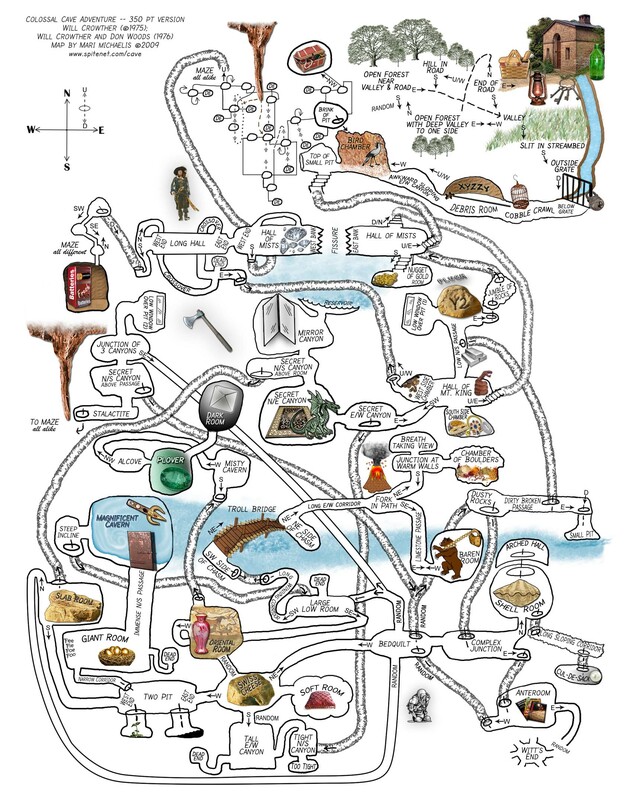 COMPLETE Spoiler Version: This version has it all - the room names, where the treasures are found and the compass points. 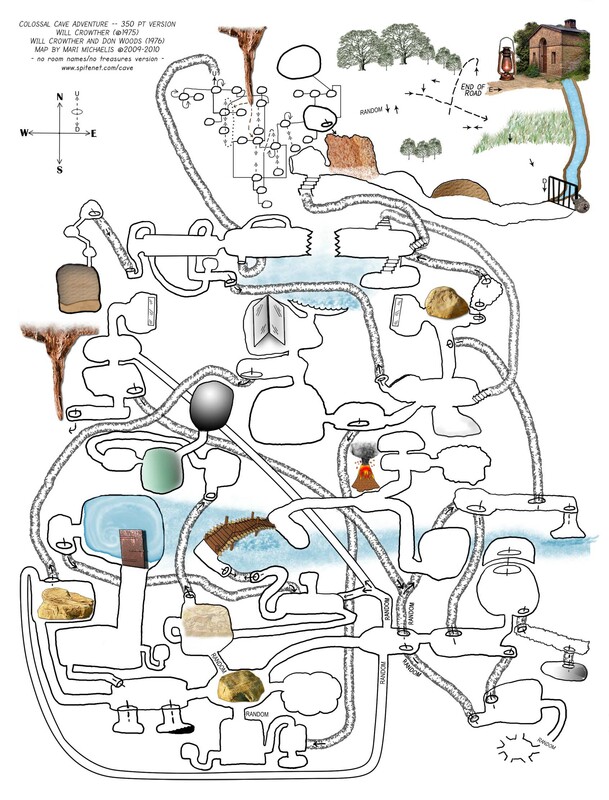 NO CLUES Version: You can navigate through the cave with this map, but the rooms are unnamed and the treasures are not marked. Might be fun if you've played the game for awhile and keep getting lost. You can fill in the room names and compass directions yourself as you go. Please feel free to drop me a line and share your caving memories if you like. It'll be nice to know if other wizards appreciate the map. Click below to view the Mobile versions, if you use the SMS text version. Right-click to download and save the jpg. 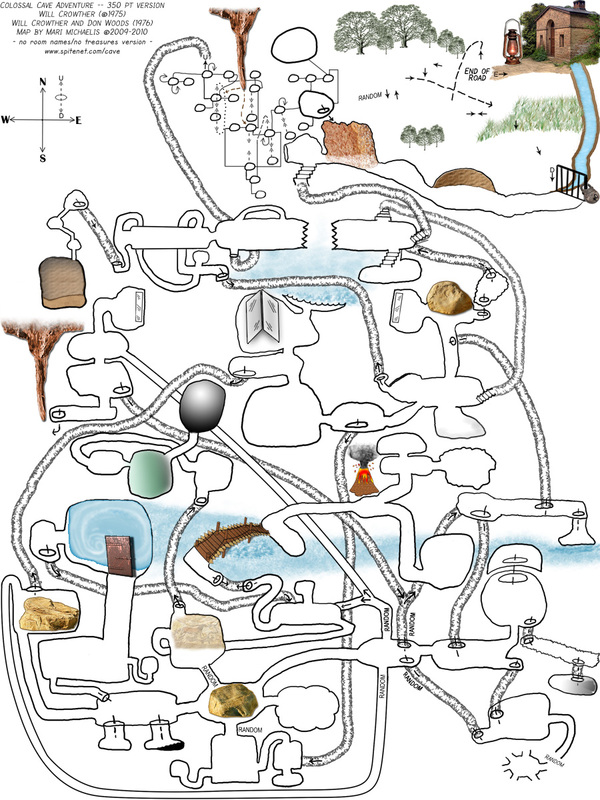 Computer History Museum - in Mountain View, CA, featured my cave map in one of their exhibits! Well worth the visit if you are in California. Get Lamp - Jason Scott's documentary film about adventures in text. Jason Scott is also the webmaster of textfiles.com, a collection of textfiles from the good ol' days of BBS. Colossal Cave Adventure -SMS Text - Play the game via texting! If you are interested in how this Python version came to be, click the YouTube link above. Christopher Swenson gives a great lecture about his adventure in trying to understand the Fortran language (what a kid!) it was written in and the complexities involved in porting it to Python. The database will remember your phone number and you can play at your leisure. See mobile phone versions of the map above. 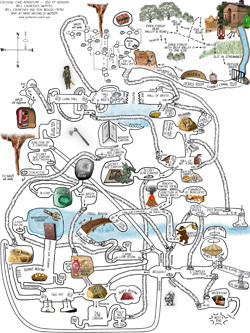 The Colossal Cave Adventure Page - Rick Adams' definitive website: history, hints, downloads, XYZZY sightings, and more. Colossal Cave Adventure 350 download the DOS version adv350win.zip. This version was updated by Al Whinery and the games can be saved. People's Republic of Interactive Fiction - Interactive Fiction aka text adventures, are alive and well! Get inspired to write your own adventure.